Methodist is now offering Employee Health-sponsored flu shot clinics. The schedule of dates and times for all locations can be found on departmental flyers and on the flu site page is on the Intranet. Bring your employee ID badge. If you get your free flu shot at a flu clinic, enjoy a free lunch! A new sticker for your employee ID badge shows you’ve received the flu shot. You must wear a mask in patient care areas during the designated “flu season”. The designation of the “flu season” will be announced when appropriate and in collaboration with Infection Prevention. To comply with the Nebraska law (which applies to Nebraska hospital workers) and Methodist Health System policy, all employees must get the flu shot, provide proof the shot was received elsewhere, or sign a declination form by Nov. 20. Flu shots will be available at various locations, dates and times. 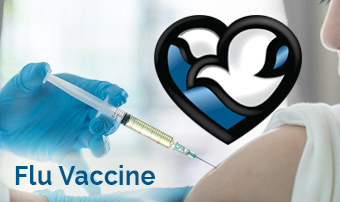 See the flu shot campaign site page for dates/locations of flu shots, declination forms and mask guidelines/FAQ’s. For your convenience, copies of your flu shot are available through the Patient Portal only. Please get a FREE flu vaccine – for your safety, the safety of your family, and that of our patients and our fellow staff members! If you have questions, call Employee Health at 402-354-5684. At Methodist Jennie Edmundson, call Employee Health at 712-396-4158.